January 2013 – Tools for strategic and strong-minded thinkers! What are the characteristics people who think strategically? Are there elements of their personality that facilitates their use of strategic thinking? Curiosity, ambition, and pragmatism (CAP) are three important traits of strategic thinkers. These traits do not define strategic thinking nor strategic thinkers, but they provide a form of energy that motivates them to acquire and practice effective strategic thinking. Strategic thinkers are intellectually curious. They ask questions in purposeful kinds of ways. Here are a few quotes that illustrate curiosity as a trait of strategic thinkers. Pragmatism is more than simply being “practical.” Pragmatism is the balance of action with reflection, as I explained in this article, action without thought is impulsiveness and thought without action is procrastination. Pragmatism is concerned with innovation and it is concerned with what works. For example, unmitigated ambition can be dangerous. Many tyrants and despots have the ambition for power, but not the ethical framework to apply their power for a higher-order principle. Curiosity, too, can be taken to an unproductive extreme. Some people are nothing more than dreamers, accomplishing little. We want to strive for a balancing of thought and action. Consider this quote from the musician Bono. Pragmatism tempers the tendency to get lost in conceptualizing and moralizing. It adds purposefulness to dreaming. Do you agree that ambition, curiosity, and pragmatism are three traits of strategic thinkers? Strategic thinking is defined as the individual’s capacity for thinking conceptually, imaginatively, systematically, and opportunistically with regard to the attainment of success in the future. Success Oriented. The word “success” needs to be considered in the context of the usual meaning of the word strategy; that is, some field of competition where the strategy exploits advantage and leads to a desirable outcome for the strategist. For example, success in a game involves winning within the boundaries of a set of game rules. Success in a military encounter might define the victor as the entity who holds the field at the conclusion of the battle. Success in business might be defined as penetrating a new market. Success in a political campaign might be defined as winning a referendum or elected office. Consider this: if there is no competition, there is no need for strategy. Richard Rumult (Good Strategy/Bad Strategy, page 127) tells us that strategy involves premeditation, anticipation of the reactions of others, and the design of coordinated action. Success is the consequence of a strategy. Thus, strategic thinking involves considering questions such as, What are the causes of success? What is the best way to design a strategy to fit the situation? Aside from the idea of competition, it is fair to assert that the definition of success is influenced by context, particularly of the stakeholder. Success could be determined as betterment over the existing situation. As a practical matter, the strategic thinker needs to address fundamental question such as, Who (and what) defines success? What metrics are in use? Notice that the opinions of individual stakeholders are relevant, so the strategist needs to consider questions such as these: Whose opinion is most important? Future Oriented. Strategic thinking involves looking towards the future with an appreciation that present-moment decisions will have impact on the future. The future may be very different from the status quo. Strategic thinking must consider the outputs of what is commonly called “futurology” or “strategic foresight.” A strategic thinker takes into account the past and present, as part of the inputs for considering the future. Cognitive. Strategic thinking employs mental process that are conceptual (abstractions, using analogy to translate across contexts), systematic (composed of different components with interfaces that interact to produce intended or emergent behaviors, pattern finding, and connecting situations that are not obviously related), imaginative (creative and visual), and opportunistic (searching for and grasping new information and value propositions). The strategic thinker applies all of these cognitive processes in the orientation towards future success. 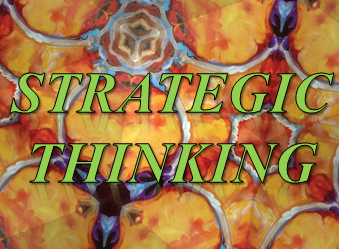 What Strategic Thinking is Not…. Strategic thinking is not the same thing as critical thinking. Although critical thinking is conceptual and systematic; experience shows that critical thinkers are less likely to be imaginative and opportunistic. Critical thinking can be a useful part of strategic thinking, but many critical thinkers are unable to think strategically; for example, designing a strategy to prevail over a competitor. Strategic thinking is not the same thing as creative thinking. Creative thinking is imaginative and playful. Typically, creative thinking attends to a lesser degree to concepts, systems, and opportunities. However, creative thinking exercises often place no attention on the future success orientation. Creative thinking can also be a useful component of strategic thinking, but they are not identical. Again, strategic thinking involves designing a strategy to prevail over competitors; that is not something we naturally consider in creative thinking. Strategic thinking is not the same thing as visionary thinking. Visionary thinking is often simply dreaming big with the intention of inspiring others to adopt the vision. While visions might be useful, they need to be balanced with realism, data, and insights as to how to achieve the dream. Strategic thinking involves a deeper level of conceptualizing – compared to visionary thinking – because the outcome that is envisions will only be achieved through creating and executing a strategy. Strategic thinking is not the same thing as strategic planning or long-range planning. Many have experienced strategic planning or long-range planning as attaching words to the organization’s annual budget. Still other writers refer to the front end of structured business planning processes as strategic thinking, but that implies that the same action would apply to other fields where strategy is practiced: politics, military, sports, games, etc. Frankly, this is just sloppy reasoning on their part. Organizations create strategies to achieve success, and the process of doing this is often termed strategic planning. However, as the paragraphs below point out, strategic thinking is an individual activity to be harnesses by group processes. Strategic thinking produces insights, which become inputs to the strategic planning process. The practice of strategic thinking by the individual may inform strategic choices and decisions. Any kind of thinking is governed by the mind, or more specifically the brain. Commonsense tells us that individuals – even people who are genetically identical – think differently and have different learned responses to coping with the world around them. It follows from that reasoning that organizations do not practice strategic thinking because there is no single brain or mind at work. Thus, strategic thinking refers to an individual’s style of thinking. Organizations are collections of personalities that share some common purposes and culture. Individuals within the organization collaborate by surfacing each individual’s thinking and sharing that those insights with others. Thus, thinking is an individual cognitive capability that generates insights and collaboration is a social process of merging and adapting those insights to meet a strategic challenge. 1. The organization should improve individual in strategic thinking competency. This could be done by training or coaching executives, high-potential employees, and those individuals who express interest in contributing to strategy. 2. It should create a cadre of individuals with competency in strategic thinking. 3. It should emphasize collaboration in its strategic planning process. This collaboration is multifaceted: up, down, and sideways in the organization. The focal point of this collaboration is on identifying insights and sharing/combining/exploiting those insights with resources to achieve competitive advantage. Each individual has a different set of experiences and perspectives. The challenge is to bring together the experiences and perspectives – and individual insights – into a synthesized understanding of the situation and the need for coordinated actions. Do you agree with the definitions and distinctions?